In Hanyu Pinyin, songhua pyidann is sōnghuā pídàn. Another technical point, this photo wasn’t taken in Taiwan proper but rather on Kinmen (金門), which provides an example of a romanization system older than Gwoyeu Romatzyh, older than Wade-Giles even. It’s postal romanization, which I regard as too mixed up to properly be called a system. In Hanyu Pinyin, Kinmen is Jinmen. The island is also known as Quemoy. 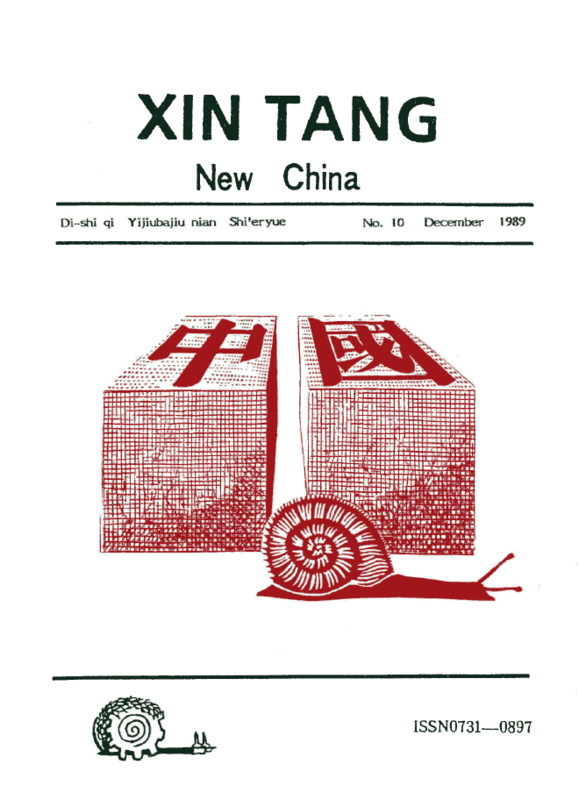 I’ve just added to Pinyin.info the tenth and final issue (December 1989) of the seminal journal Xin Tang. I strongly encourage everyone to take a look at it and some of the other issues. Copies of this journal are extremely rare; but their importance is such that I’ll be putting all of them online here over the years. Although I’m giving the table of contents in English, the articles themselves are in Mandarin and written in Pinyin. ZHANG LIQING: How Should the Tones of Chinese Spelling Be Indicated? 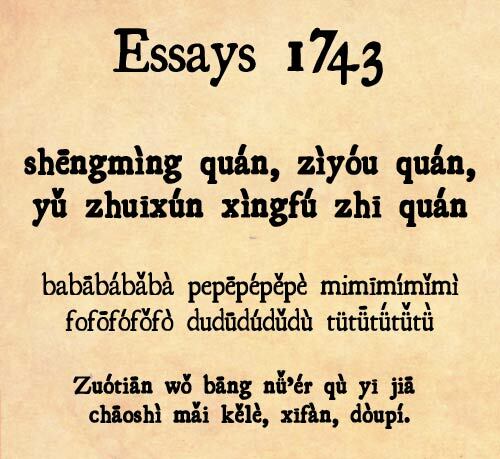 Essays 1743 is a public-domain font family that has all of the vowel/diacritic combinations needed for Hanyu Pinyin, though the third-tone marks tend to look a bit stiff relative to everything else. Regardless, I’m a sucker for old-style figures (e.g., examples B and D). 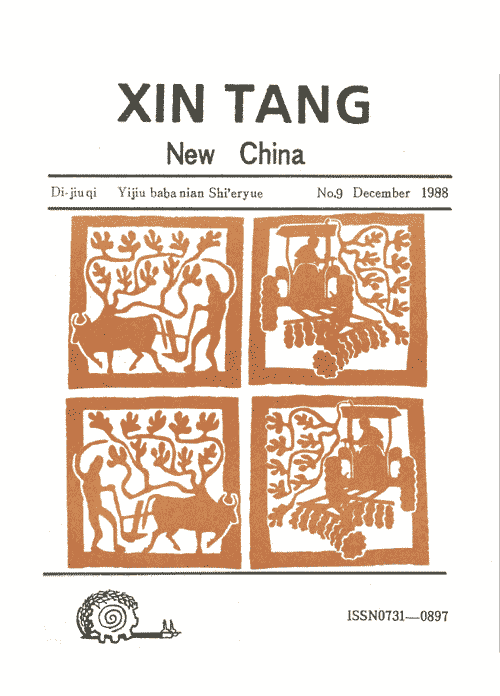 The ninth issue of Xin Tang is now available here on Pinyin.info. The journal, which was published in the 1980s, is in and about romanization. By this point in its publication most everything in it was written in Hanyu Pinyin (as opposed to Gwoyeu Romatzyh or another system). Xin Tang is interesting not just as a forum in which one can read original content in Pinyin. It’s also important for the history of Pinyin itself. Over the course of its nearly decade-long run, one can see its authors (including many top people in romanization) working out Pinyin as a real script. Here’s an English version of the table of contents. 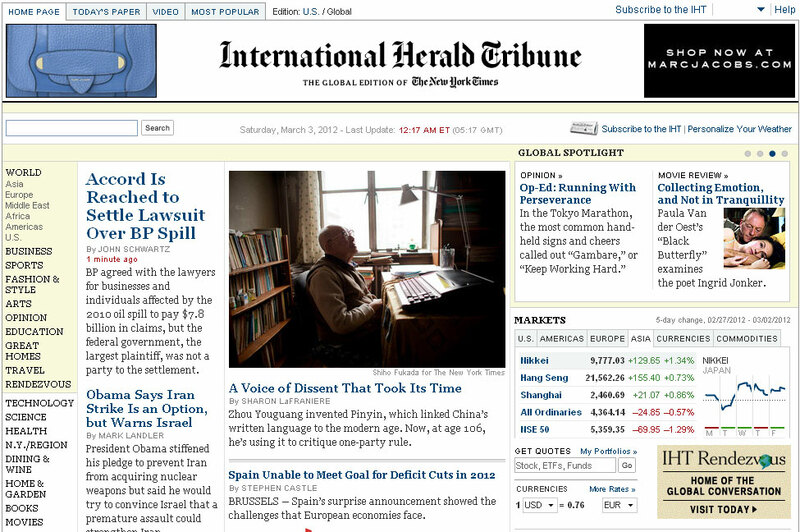 Note that the articles themselves are, for the most part, in Mandarin. Zhang Liqing: Must Written Chinese Have Tones Indicated? 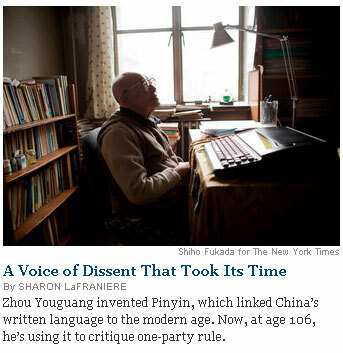 The New York Times has just published a profile of Zhou Youguang, who is often called “the father of Pinyin” (though he modestly prefers to stress that others worked with him): A Chinese Voice of Dissent That Took Its Time. This profile focuses not only on Zhou’s role in the creation of Hanyu Pinyin but also on his political views, which he has become increasingly public with. No sooner had the first batch of copies been printed than the book was banned in China. Although the reporter’s assertion, following the PRC’s official figures, that “China all but stamp[ed] out illiteracy” is well wide of the mark, there is no denying Pinyin’s crucial role in this area. I recommend reading the whole article. The standard for alphabetically sorting Hanyu Pinyin is given in the ABC dictionary series edited by John DeFrancis and issued by the University of Hawaii Press. The ordering is primarily simply alphabetical. Diacritical marks, punctuation, juncture and capitalization are only taken into account when the strings being compared are otherwise identical. For example, píng’ān sorts before pīnyīn, because pingan sorts before pinyin, because g precedes y alphabetically. Only when two strings are alphabetically identical is non-alphabetical information taken into account. The series’ Reader’s Guide presents the specifics of the sort order. Since I don’t have to worry about how much space this takes up on my site, I have reformatted the information slightly to give the examples as numbered lists. Irrespective of tones, entries with the vowel u precede those with ü. For entries with identical spelling, including tones, arrangement is by order of frequency…. One can see this in action in the A entries for the ABC English-Chinese, Chinese-English Dictionary. And here are some sample pages from an earlier ABC dictionary. HPC [Hanyu Pinyin Cihui] gave hyphens and spaces the same priority as apostrophes, so that lìgōng sorted before lǐ-gōng, in spite of the tones. 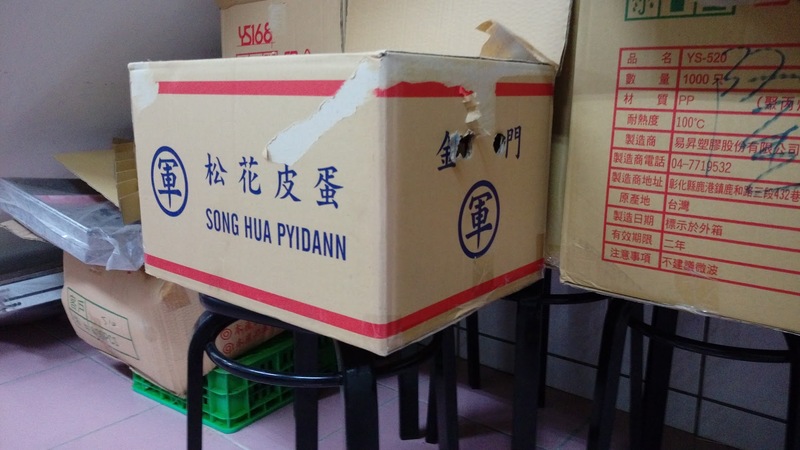 Usage of hyphens and spaces in pinyin is still far from being fully standardized. (The same is true in English orthography.) Consequently, for collation it makes sense to give less weight to hyphens and spaces, and more weight to tones, thus sorting lǐ-gōng before lìgōng. In ABC, hyphens and spaces don’t affect the sort order unless they change the pronunciation in the same way that apostrophe would; for example, ¹míng-àn 明暗 and ²míng’àn 冥暗 are treated as homophones, and they sort after mǐngǎn 敏感. 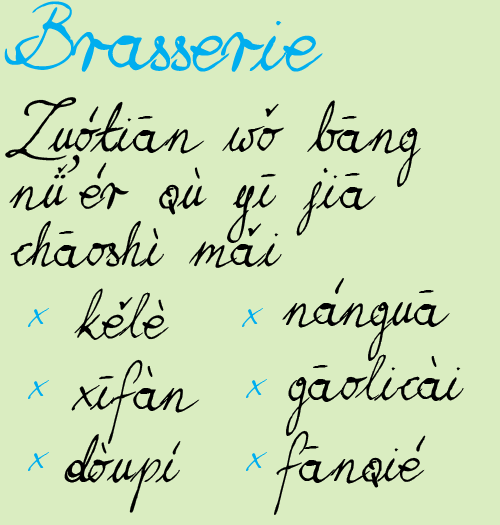 Brasserie is a Pinyin-friendly script font. It’s free for personal use and US$11 for commercial use.